Moshulu was a ship of strength, one of the last four-masted steel barques ever built. Named for the four masted ship, Moshulu is now a new project combining four legends of music. 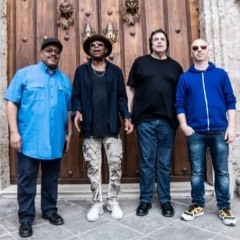 Bassist Jeff Berlin (Bill Bruford, Allan Holdsworth, HBC), drummer Dennis Chambers (Funkadelics, John Scofield, Santana), keyboardist/guitarist David Sancious (Bruce Springsteen, Sting) and the great guitarist Oz Noy, join together bringing masters playing with intensity and skill. ​Moshulu's repertoire goes from funk, rock, metal, fusion into new classical and improvisation. Their individual playing skills have blown people away for decades. Together, they are THE band to watch in coming years. They are a musical ship that will take the audience on a journey into powerful and beautiful music.